I don’t know about you, but I always feel like I never have enough time in the day to get everything that I want to get done, done. Ever see those people who seem to have everything organized? They seem to have their life together. Do you feel like that person? Me? Nope, I don’t. As much as I write lists and keep a planner (yes, a physical planner #OldSchool), I always feel like I have something else to do and the list is never ending. I don’t understand when people say they are ‘bored.’ There is always something to keep me occupied. You feel the same? My mother gave me good advice. She said that it’s nonsense stressing yourself out trying to get everything done because there will always be more to do so take a minute and breathe. Makes sense when you think of it like that. Kind of puts things into perspective. Despite running around like a crazy person half the time, I always make time to work out. Let me rephrase that – I have to make time to work out. Running a food blog, testing recipes, eating said recipes and just enjoying eating (and wine – duh) in general, there’s no way in this world that I can not work out. So suffice to say, I love easy, healthy dinners that can be prepared in little time so I can get on with my day, get that work out done and move on – feel me? Once every blue moon, hubby is not home for dinner or vice versa. That doesn’t mean I’m going to veg out on some cereal or take out. I want real food and real food, fast. The thing with cooking for one is ya don’t want to spend a whole lot of time at it so this recipe works perfectly. 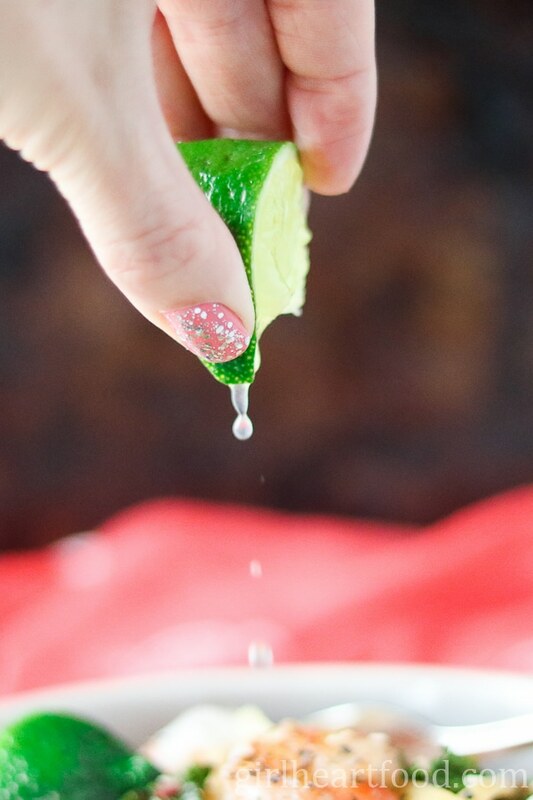 Though there’s lime in the sauce, I love to squeeze with an extra bit to give it a little zing. 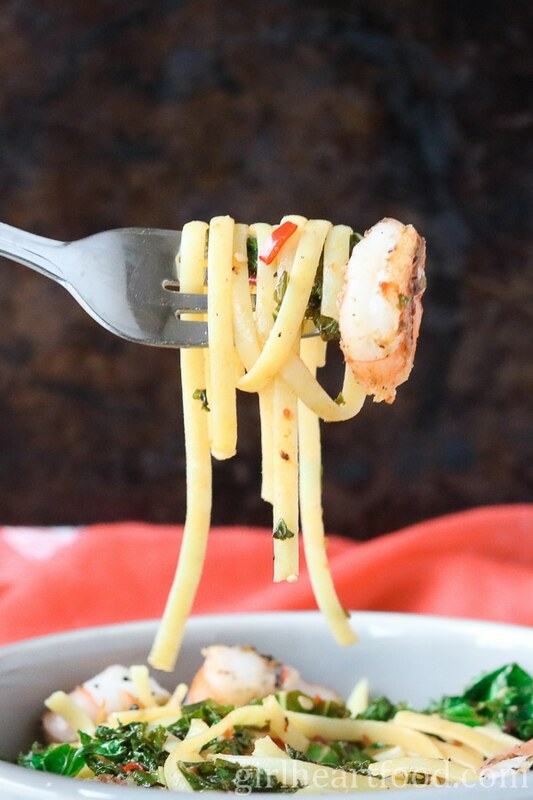 This recipe for Chili Shrimp Pasta is for one but can easily be doubled or quadrupled according to how many people you want to serve. Just adjust the quantities accordingly. In a large pot of boiling, salted water cook pasta per package instructions. Drain (reserving 1/4 cup of the cooking water). While pasta is cooking, make sauce. Whisk together soya sauce, sesame oil, chili garlic sauce, fish sauce, rice wine vinegar and lime juice. Lay to one side. In a non stick pan on medium low heat add 1/2 tsp of olive oil. Cook garlic and chili for one minute. Add kale and cook two minutes. Remove from pan. Add remaining 1/2 tsp of olive oil to pan and cook shrimp about 3 minutes, turning halfway. Remove from pan. Add sauce to pan along with 1/4 cup of pasta water. Cook 2 minutes. Toss with pasta and remainder of cooked ingredients. Place in bowl and garnish with sesame seeds and squeeze additional lime, if desired. Enjoy! This is one of the best seafood pasta I have ever tasted. The chili shrimp flavor was a delight and perfect to this cold weather. Thank you for sharing this recipe. I totally get *having* to work out. OMG with all the baking I do…it’s REQUIRED haha. This chili pasta looks amazing. And just the perfect serving size for me me me 🙂 I’m a little wary of “gluten-free” so I’m so glad to know you like this one from Barilla! I know you got our back. Right?! Haha!! Thank you Jolina! You’d love this pasta; I’m sure of it! Have a great weekend, my friend! This sounds delicious! Love the single size serving, so many recipes can leave behind copious leftovers and sometimes you just want the perfect amount of food! I love pasta! And I love this recipe! Delicious! Do not get how anyone can get bored when there is a million things one can do! Love easy shrimp dinners. they are a favorite in our house. This one looks delicious! It’s one of my biggest pet peeves when people say they’re bored!! I have NO idea what boredom must feel like! And I’m also definitely not one of those organized/has everything together type people. I wish!! Good for you for always making time to work out… Another thing I definitely do not do. 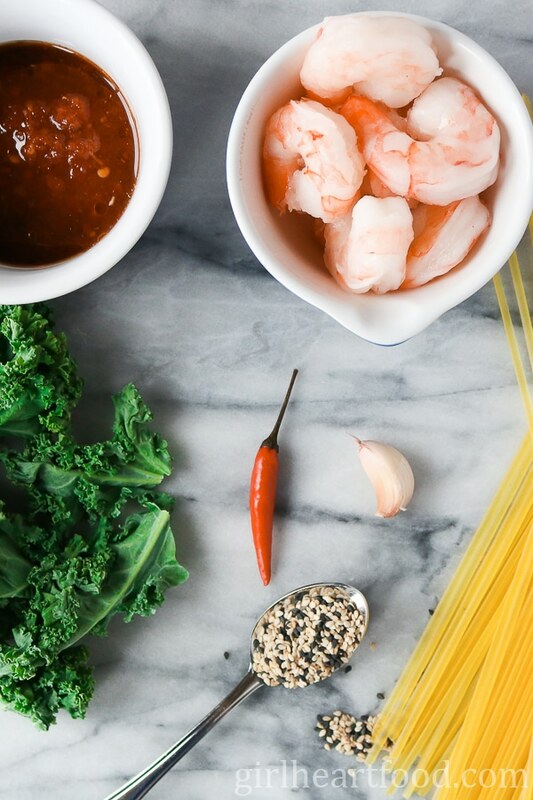 But I totally want to make this chili shrimp pasta; it’s RIGHT up my alley and nice and quick, too! Right?! Glad I’m not the only one 😉 Thanks so much Sues! Gotta love quick meals! I’ll take double quantity and still call it ‘for one’. I can eat it after Barre class to justify the size of my portion:) Another citrus drops shot!! Love. Do you know about Tinchos? It’s semi sparkling white wine with lime juice and soda. How great this dish would pair with a Tincho…! Pinned. I like your thinking, Milena 😉 No! I do not! I’ll have to keep my eye out for that cause it definitely sounds like a lovely pairing with this recipe 🙂 Thanks so much, my friend! Oh man, what would we do without our workouts? For real, I’d need a crane to get me out of the house :). I’m loving this pasta, Dawn! I love that it’s not too saucy, so the shrimp can really stand out. And of course I love how quickly it comes together! Have a great week, my dear! I am always running around like a crazy person, that’s why I go to yoga often, to remember to breathe :-). This pasta sounds and looks so tasty! 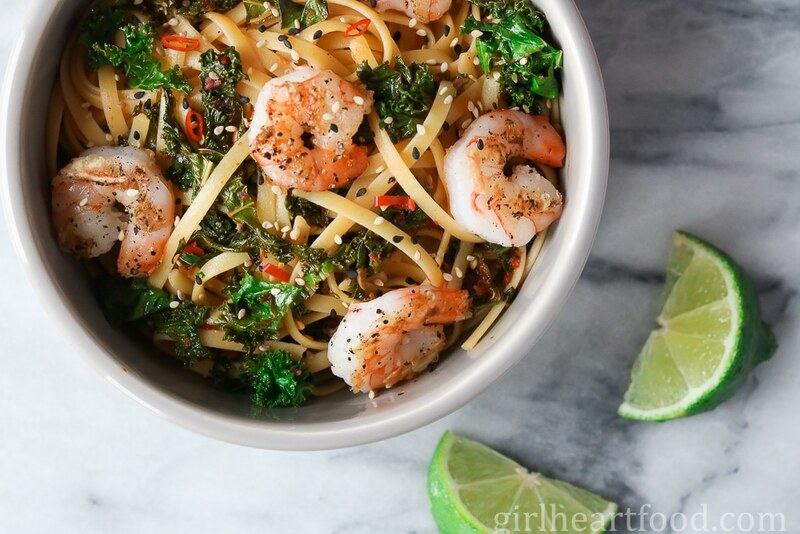 I love shrimp in pasta and that kale and a bit of chili, just adds more flavor and interest. 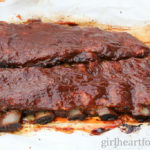 Great weeknight meal! I agree with Kathy! How quick and easy is this meal Dawn?! And it’s got my favorite…shrimp! I know my husband Tom would love it too. On my list my friend! Thanks and have a fabulous week! Your mama is a wise woman! We should all follow her advice! 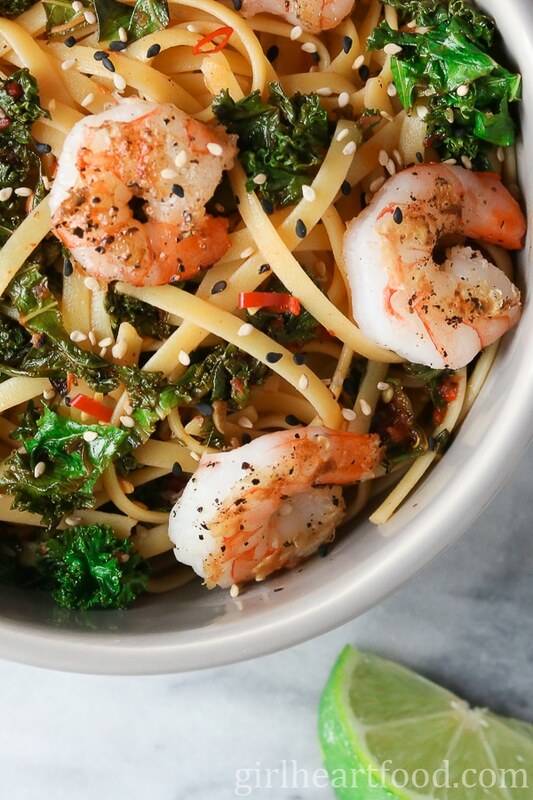 This pasta and shrimp looks so great! I love the super light sauce and shrimp!